Found one file extension association related to CryptoNG and 1 file format developed specifically for use with CryptoNG. CryptoNG is easy to operate file encryption software for personal and professional security. It allows you to protect the privacy of sensitive files, by encrypting them with AES-256 encryption algorithm. Authenticated encryption algorithm provide both data authenticity (integrity) and confidentiality. This makes the encryption very secure. Once the information has been encrypted, it can be stored on insecure media or transmitted on an insecure network /like the Internet/ and still remain secret. Later, the information can be decrypted into its original form. 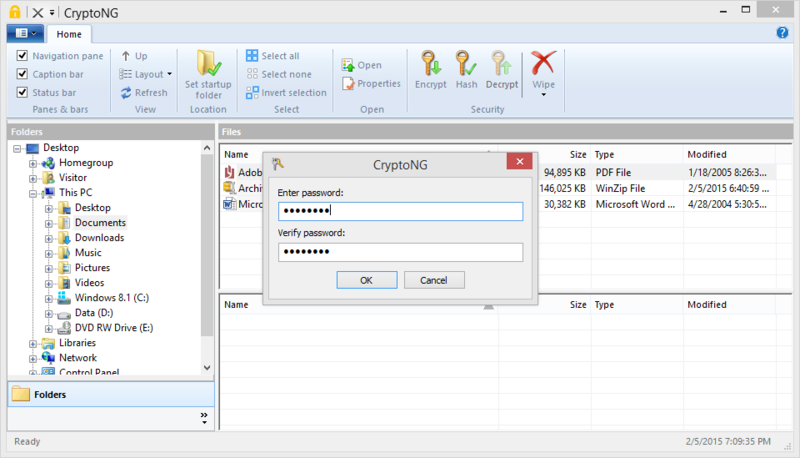 CryptoNG integrates the strongest encryption available today into the Windows environment. If you need more information please contact the developers of CryptoNG (Vassil Arabadjiev), or check out their product website.